The process of pollination is an important part of nature. A pollinator’s job is to help guide plants through their life cycle by carrying delivering pollen for fertilization. In the United States, honey bees play a major role in plant fertilization and are one of the most important pollinators in the agricultural industry. Below, we share some facts about pollination that may get you thinking about bees in a more positive light. The reproductive life cycle of a plant depends heavily on pollinators. Plants release a powdery substance known as pollen from the male part of a flower. In order to procreate, a plant must be able to spread their pollen to other nearby plants in order to fertilize. This can be done in one of two ways. Pollen that is light enough can get picked up by the wind and carried to other nearby plants. Plants that are pollinated through this method include corn, rice, wheat, grass, and some hardwood trees such as pine or fir. Many plants produce heavier pollen that cannot be easily picked up by the wind. These plants require the assistance of an animal pollinator. Animal pollinators include birds, insects, and small mammals. When a pollinator approaches a plant, pollen will cling to its body to be carried onto another plant. Whether it by wind or by animal transfer, plants depend on pollinators to spread their pollen and help develop the seeds needed for reproduction. The relationship between honey bees and flowers is an important one, as neither species would survive without the other. Farmers have been taking advantage of their symbiotic relationship for hundreds of years to help the development of their crop. It is estimated that honey bees contribute around $20 billion dollars of pollination work to the United States agricultural business. Farmers will install beehives around their crops and let nature run its course. Bees are known to pollinate around 400 types of agricultural crops, including apples, melons, broccoli and more. It is currently believed that there are over 2.5 million honey bee colonies in the United States, all working diligently to pollinate the flowers and grow their hives. This makes honey bees by far the number one animal pollinator in the United States, if not the world. When it comes to almonds, California is king. About 80 percent of the world’s almonds come from California, making them the number one almond exporter across the globe. To grow their almond trees, Californian farmers depend on the honey bee to cross-pollinate their trees for the best almond products available. Almond farmers need approximately two hives worth of bees for each acre of almond trees. Due to the overwhelming need for almonds, there are likely 1.7 million hives utilized in the California almond groves. This accounts for 85 percent of commercial hives in the United States, according to the American Beekeeping Federation. 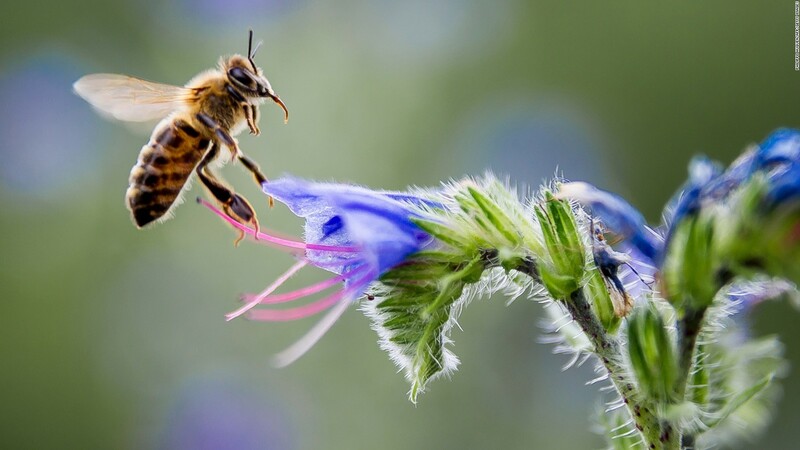 Besides almonds, honey bees are also used to fertilize a variety of other crops. This includes fruits like apples or peaches, avocados, coffee, cotton, nuts, beans, and more. They are also important in the production of cooking products, such as sunflower oil and cocoa. We’ve all heard bee enthusiasts go on about how we need to save the bees or risk the mass extinction of popular crops. While the situation may not be as dire as it’s made out to be, pollinator decline facts have been showing steady patterns of pollinator death throughout the years. Many of the world’s pollinators have recently been added to the endangered species list, including thousands of species of honey bees. In fact, more and more beekeepers are reporting the disappearances of entire hives, a phenomenon known as Colony Collapse Disorder. What is causing this massive colony collapse? While scientists are still looking for more definitive answers, many blame the overuse of pesticides sprayed on crops. Honey bees tend to avoid the crops that have been sprayed but may be forced to collect their nectar if the hive food supply is low. Some pesticides are so harmful to the bees that they have been completely banned from use. Experts are also suggesting that global warming may take a part in the rise of colony collapse disorder. Climate change has caused some flowers to bloom earlier than before, leaving hibernating bees without any food once they are ready to start foraging. Luckily, there are steps everyone can take to help protect the bees and keep our crops pollinated. Farms should try to avoid spraying harmful pesticides on crops that need to be pollinated, or wait until late evening when the bees have returned to their hives. Others can help by planting native wildflowers in their yards, which will help the bees feed. We hope you enjoyed these honey bee pollination facts! By sharing these facts with your friends, you can help by educating them about how much the world needs bees. By working together, we can work hard to keep the bee population happy and healthy so they can continue to provide us with the crops we know and love.